We've all been given the familiar advice by parents anxious to get us eating our vegetables, but is there any truth in it? Martin Fone, author of 'Fifty Curious Questions', investigates. ‘Eat up your carrots’, I was told as a child. ‘They will make you see better in the dark.’ It was something I swallowed at the time, but now that I am older (if not any wiser), I wonder whether it is an old wives’ tale or there really is something to it. Our pursuit for the truth starts with the dark days of World War II, when Britain was under attack from German bombers, and when the British government instituted blackouts to make the prospective targets for the night-time raiders more difficult to identify. By 1939 the Royal Air Force was prototyping a radar system known as on-board Air Interception Radar that enabled it to spot enemy aircraft as they crossed the Channel. In 1940 John Cunningham, who was nicknamed ‘Cat’s Eyes’ because he downed nineteen of his twenty kills at night, shot the first enemy plane down using the system. Radar was to have a transforming effect on the fortunes of war. Naturally, the Brits wanted to keep it under wraps but at the same time wanted to raise home morale. So some genius thought that Cunningham’s success could be ascribed to his consumption of carrots. An advertising campaign was launched, proclaiming in the stilted style of the time: ‘Carrots keep you healthy and help you see in the blackout’. Catchy or what? This campaign coincided with a glut of carrots at the time, and the government was struggling to find ways to encourage the reluctant public to consume indigenous root crops. 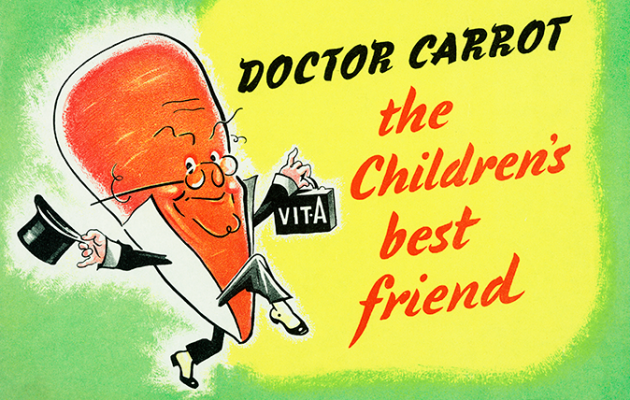 Colourful characters such as Doctor Carrot and Potato Pete were introduced in 1941 to aid the campaign. Even Walt Disney got into the act. One of their leading cartoonists, Hank Porter, created a whole family based on the Doctor Carrot idea, consisting of the likes of Carroty George, Pop Carrot, and Clara Carrot. And it worked. The Ministry of Food in February 1941 was able to report: ‘The consumption of carrots has increased following the Ministry’s publicity campaign’. Whether the Germans were as gullible is another story. There is, though, a modicum of truth in the story. Carrots have long been known to be beneficial to the overall health of the eye because of its high vitamin A content. Specifically, vitamin A protects the eyes from night blindness, and not having enough of the orange root vegetable can lead to problems such as dry eye and cataracts. So there is at least a case to make that the carrot helps to keep the eyes healthy, even if they don’t imbue you with the power to see at night. And before we go, one additional carrot factoid. Their original colour was purple. It was only in the seventeenth century that the orange carrot that we are so familiar with started to appear, thanks to the work of Dutch horticulturists, probably in an attempt to get the colouration of the vegetable to match the national flag of the time. Britain's ingenuity in the wartime extended to the kitchen, and there's no better example of this than the humble carrot.